This fanedits eliminates M.Night Shyamalan’s role and tightens up the action. With an additional deleted scene, this becomes a fresh new ride. The third in a series of wonderful films directed by M. Night Shyamalan. I love the film but must confess I am always taken away from the story when it comes to the director’s ubiquitous cameo. So this fanedits eliminates his role and tightens up the action. With an additional deleted scene, I hope this becomes a fresh new ride. - We lose Mr. M. Knight Shyamalan’s cameo. - Added a deleted scene. 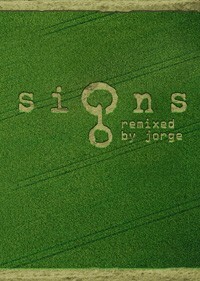 I thought this was a really good (albeit simple) re-edit of Signs. I always enjoyed Signs and yeah I can admit the ending is kind of lame, but the pacing, writing and acting for the majority of the movie is excellent. I agree with Jorge that Shyamalan's cameo can bring you out of the movie, but really only because of who he is now, at the time it didn't matter that it was M. Night in that role. Anyway. I watched the DVD version and the quality was great, equal to the quality of the DVD. All the editing was done perfectly and I liked the way the story flowed this time around. I didn't even notice the continuity errors a previous reviewer brought up. This is my go-to version of Signs from now on. First of all, thanks for your hard work. 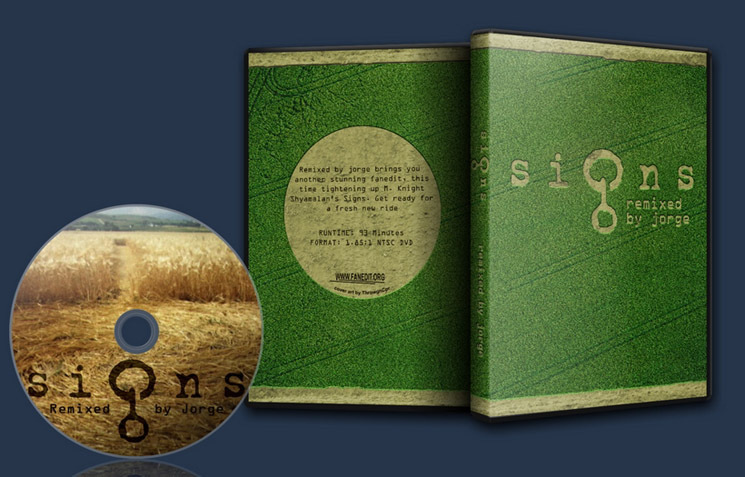 Signs is my favorite M. Night movie despite its flaws, some of which you rectified. I viewed the avi, and there are major problems with the file. It is encoded in divx instead of xvid for some reason, and the results are awful. Artifacting is really atrocious and detracts from the enjoyment of the movie. There are no hard audio cuts or bad video transitions to be found. Technically, it is great. I love how you removed M. Night’s character from the film. Given the footage available, you did a nice job mixing him out. The motivation for Gibson’s character to enter the house changes from M Night telling him an alien is inside, to the ran sacked office causing concern. It is subtle, but works wonderfully. There is very small continuity error created early on when the family goes to town. In the original, Gibson’s character tells the family they need to stop watching television and they set off. Later, Gibson turns off the radio and says “No radio either. Just for a while.” This refers back to a removed bit of dialogue. The same continuity error reoccurs later after Gibson’s encounter with the alien in the field. He says something like “Alright, we can turn on the tv now” It is a small issue, but noticeable to a fan of the film. The addition of the deleted scene was done really nicely. Obviously, it is not the same quality as the rest of the film but good enough. It really fleshes out the escape to the cellar and makes Gibson’s character look even nuttier. I think it really adds to the break down of his character and makes his return of faith later play a little better. The montage at the end was a nice touch as well. All in all, it was a nice edit. I think you should probably remove the divx version altogether, and either replace it with a nice xvid rip or just leave it off. It really lowers the quality of the work.